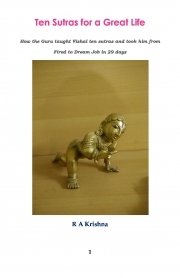 Description of "Ten Sutras for a Great Life (eBook)"
Vishal is fired from his job as his company relocates. He is despondent and meets the Guru whose name is Vishnu. Vishnu teaches him Ten Sutras or precepts, and brings Vishal out of despondency. This helps him land a dream job and brings love to his life. The author is a former banker who served in banking and related areas over a period of 42 years. He has worked in India and overseas during that period. Since 2014, Krishna has taken up smaller projects in India. Krishna is keenly interested in spirituality and some aspects of philosophy. This book is the culmination of his interests in these subjects. Krishna is based in Bengaluru and loves the city. The places mentioned in the book, apart from the Pentagon Club, are real! Reviews of "Ten Sutras for a Great Life (eBook)"
Peace, harmony and Happiness is what we all seek in Life. However, not much of it we experience in today's stress filled world. This short book, highlights in easy steps, the way to overcome stress and make life meaningful. A must read for the present younger generation." The book is in the form of a story. The language is lucid and the pace fast. Overall the book is entertaining as well as educative. An excellent book full of precious little practical nuggets for stress free living with fulfilment ! Krishna creatively blends the spiritual dimensions with the pragmatic ones and is hence able to offer realistic and relevant approaches to solving problems. It is easy for all to relate to and identify themselves with the situations shown in the book. All in all, a commendable maiden effort that has landed a wicket maiden ! Kudos to the author ! The book has an interesting title, which makes it an impulsive buy. The book is well written. The Preface gives an indication that the book may have spiritual content. The framework of Fable makes the reading breezy. The language is quite good and just right, making reading a pleasure. The slightly over 100 pages book can be read in about one hour. The Sutras themselves, are quite profound. They contain the wisdom of several voluminous books and perhaps, author’s own experience in the realm of spirituality. Although, the extent to which putting these Sutras to work itself helped Vishal, the protagonist, become successful is not very clear, the Sutras themselves are a very good guide for anybody to achieve a stress-free, contented, happy, healthy and successful life. Overall, this is a book which worth reading and having in one’s possession for repeated reading every now and then.